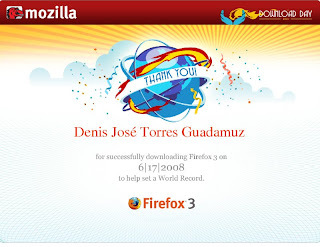 Firefox Download Day - We did it! So I got my certificate, to remember that I was part of this! From Nicaragua only 6,034 downloads were made, in America Central we (Nicaragua) made only more downloads than Honduras, I suppose because here in Nicaragua the Internet access is not yet easy for all people.